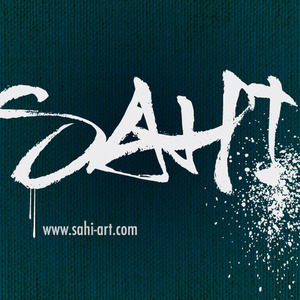 Madrid-born and -based artist SAHI paints in a dramatic style that arrests and holds viewers' attention through a series of powerful yet delicately balanced disparities. Most evidently his style of figurative composition, which focuses on between one and three subjects "” portrait sitters, dancers, athletes, etc. "” mixes very representational human characters with drips, distortions and powerful expressionist brushstrokes whose disfiguring effects at times evoke Francis Bacon. This mix of controlled precision and fervent brushwork works together with the other tensions that make SAHI's works so engaging and exciting. Chief among these is the manner in which his subjects' elegant embodiment of poise and strength, restraint and power, echoes the artist's steady yet expressive hand and brush. The relationship between those figures and their abstract surroundings provides another source of understated conflict, with backdrops of bright primaries and muted monochromes seemingly threatening to overwhelm the human actors performing against them. But in every case SAHI maneuvers these agile and powerful elements into an exquisite equilibrium.